Experiencing nature in New England through education and travel. Including dog friendly opportunities. table umbrella in our yard. It is spring in New England and our feathered friends are busy, busy, busy! With all the activity it is easy to stumble upon what may appear to be an injured bird. During this time of year, I am happy to say that usually the bird in question is most likely a fledgeling. A fledgeling is a bird that has just left its nest and is learning to fly. It is important to know that many fledgelings spend quite a bit of time hoping around on the ground. Do not worry, their parents are close by, they are always under a watchful eye. I learned this lesson one day when I was trying to capture a fledging cardinal. It is important to take a moment, observe and learn the difference between typical and not so typical bird behavior. Spring is also a great time to observe the birds in your yard. 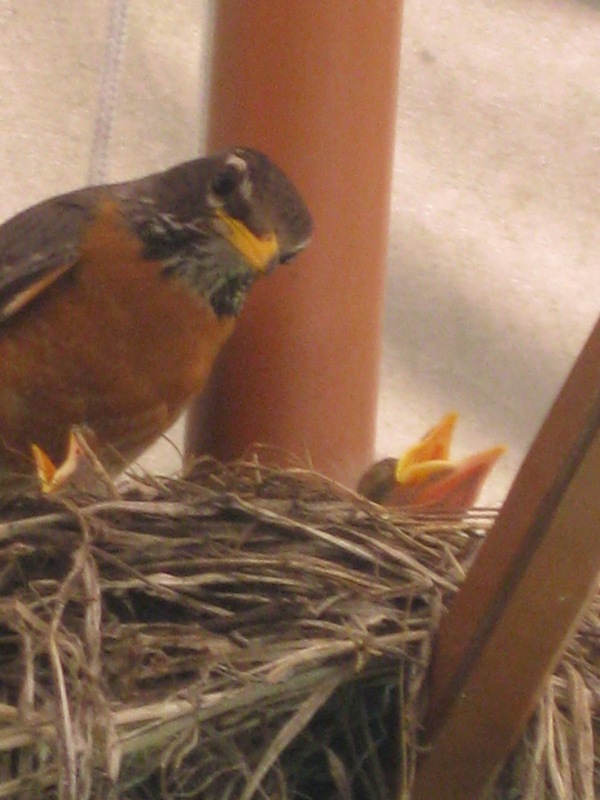 One spring we had a robin create a nest under our table umbrella, it provided a wonderful learning experience for the whole family. I also learned the difference between nestlings and fledgelings as I tried to put back the fledgelings that were hopping from the nest. When they are ready, they are ready to leave! Before you find yourself face to face with an injured bird, it is best to know what to look for and who to call. If you stumbled upon this blog because you are in an emergency situation, call your town animal control. Otherwise, familiarize yourself with the steps to take in rescuing an injured bird. Following the steps below will ensure the safety and future for the injured bird. Never under any circumstance should you attempt to keep an injured bird and care for it yourself. There are laws that protect birds so finding out who to call is the best option for everyone involved. Most likely if you found an injured bird it is either a bird of prey or a song bird. During the late spring and summer baby birds may have left the nest prematurely and are referred to as nestlings. Nestlings if small enough can be placed back in the nest. If the bird appears to be larger and moving around freely it is most likely a fledgling. Observe the bird for a couple of hours. If it can walk, hop, and flap its wings, or if adult birds are nearby, leave the bird alone. The parents will continue to care for it. If a bird on the ground is unable to flap its wings and appears to be alone it is probably injured. Slowly approach the bird, and if it doesn't fly away when you’re within 10 feet or so, there may be something wrong. When a bird hits a window, swelling in the brain may temporarily incapacitate it. Countless times, I have run out of the house to find a poor birds lifeless on the ground, then all of a sudden it will shake itself and fly away. In some cases, it may take a while. If there are cats or other predators nearby, place the bird in an enclosed box or under a colander to keep it safe. Handle the bird as little as possible and do not attempt to give it food or water. As the swelling subsides and the bird becomes more active, you may release it. Now is the time to find out who to call in your area for emergency injured bird services. A google search for your state will provide you with specifics and laws around transporting and rescuing birds. Each state has a certified wildlife rehabilitator and though they may not be able to come to your location to physically pick up the injured bird, they can provide you with the protocol should the event happen to you. 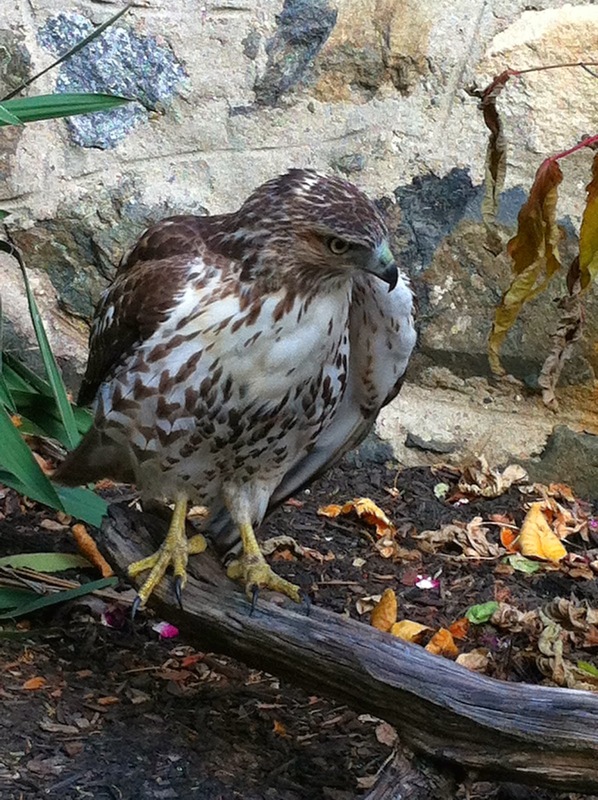 Injured juvenile red tailed hawk that arrived in our yard. I call animal control in our town. Interesting to note, in Massachusetts, rehabilitates are usually unable to respond to pick up injured wildlife, but they will provide advice on the best procedures for safely collecting the animal and will offer directions to their facility. This is a problem when it comes to birds of prey because unlike a song bird, they are dangerous to handle. The best thing to do is call your local wildlife rehabilitator ahead of time and ask them who they recommend you contact in your area should you find an injured bird of prey. Unlike birds of prey, it is easier to deal with the capture of an injured song bird. They are much smaller and it is far easier to place an object like a small box or colander over them. Like Birds of Prey, your local wildlife rehabilitator will be able to give you information on whom to call. It is important to remember that mortality rates in wildlife is extremely high. Birds especially. It is natures way of maintaining balance. It is a different world from ours in that as harsh as it sounds, sometimes our well intentioned human acts often prolong suffering and distress for our feathered friends. Naturalists learn to accept that a sick or injured bird becomes prey for another animal thus ensuring that animals survival. There are some amazing wildlife sanctuaries and refugees who care for these injured animals once emergency medical care has been given and their fate is determined. Often times juvenile birds make wonderful additions to wildlife education centers. They are young enough to learn to be handled safely and brought about to classrooms or live comfortably in a sanctuary. Other birds are able to be released back into the wild. Check out some great places I have visited that dedicate their time and efforts to these amazing birds! Sanctuaries that make a difference for the lives of birds.